In the great glass debt ceiling debate, the only way to break through is by using the Wonkavator. Will Obama get access to it? 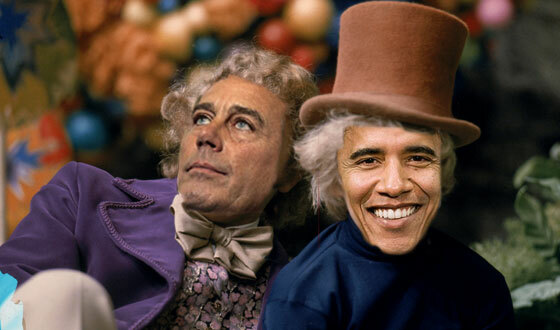 Wonka (Boehner) is at his wits end with various democratic debt ceiling proposals. He’s rejected them as they’ve fallen into a river of chocolate, fallen into a trash shoot, and turned into a giant blueberry. He sits in his Speak of the House office, which was decorated by incoming Tea Party congressional members, whose desire to cut the national debt in half is represented by the office decor. Meanwhile, Charlie (Obama) and Grandpa Joe Biden are still determined to figure out a debt ceiling compromise even after the other proposals have faltered (some in delicious fashion). In a previous scene, Charlie and Grandpa Joe almost met a certain political death, as they were nearly chopped to pieces by default fan blades protecting a seemingly unmovable debt ceiling. Now, as the deadline approaches, a reticent Charlie and Grandpa Joe Biden have one last conversation with Wonka and Slugworth (Eric Cantor). Will a final concession from Charlie — the turning over of the Everlasting Gobstopper (Medicaid and Medicare) to the Republican House — be enough to break through the glass (debt) ceiling? Let’s find out. Good day sir!